Uncontrolled metal detecting can be one of the most destructive activities at an historic-period archaeological site, especially a battle or military site. And it is illegal to metal detect, or remove any artifacts, from a National Park without an Archaeological Resource Protection Act (ARPA) permit. But with the proper research design and permits a systematic metal detector survey can be a very powerful archaeological tool. 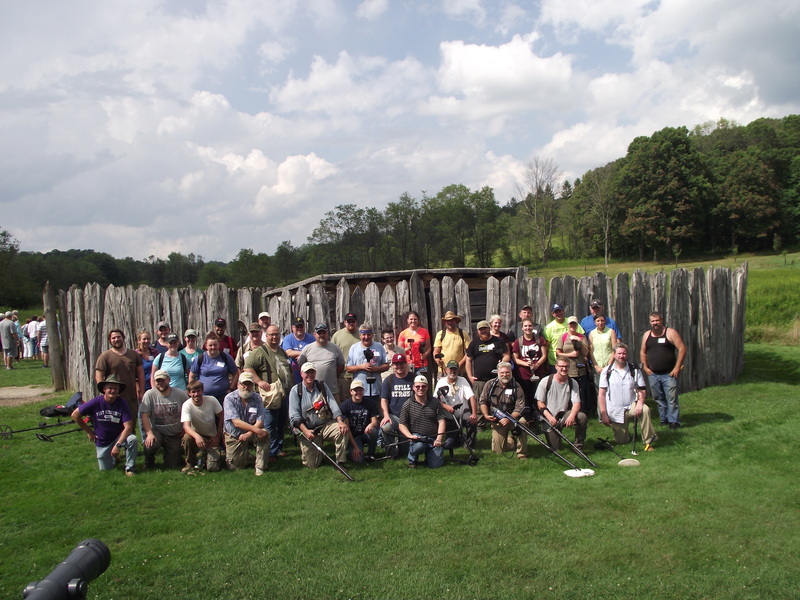 That’s what 16 IUP students and faculty learned at Fort Necessity this past weekend. 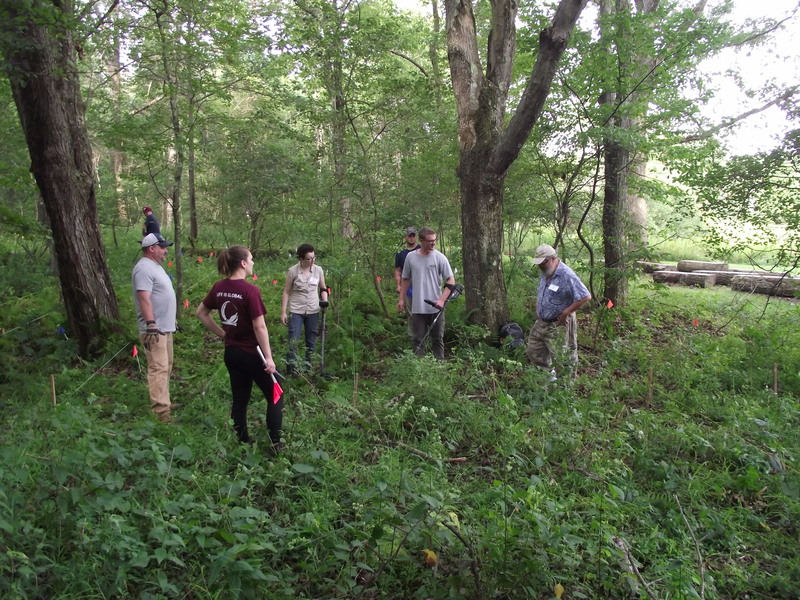 The class was taught by the Advanced Metal Detecting for Archaeologists (AMDA) as a Register of Professional Archaeologists (RPA) continuing education course. In addition to IUP, 10 other participants from Cal, Juniata, University of Binghamton, and the National Park Service took the class. AMDA is a group of professional archaeologists dedicated to integrating metal detecting into archaeological research. Since IUP has an excellent assemblage of geophysical equipment, it was natural for us to add metal detecting to our skill-set. IUP Anthropology undergraduates Amanda Telep, Chyna Haley, James Miller, and Brendan Cole learning proper technique from AMDA instructor Sheldon Skaggs. Photo by Chris Espenshade. The class began with a day of lectures on the mechanics and use of metal detectors, as well as many examples of how metal detectors can be used for historic and pre-contact period archaeology. The next two days were spent in the field collecting real archaeology data. Quick history of Fort Necessity: A 22-year old George Washington was sent to western PA to push the French from the region. On May 28, 1754 colonial and native soldiers under Washington’s command killed Joseph Coulon de Jumonville and most of his force who were carrying a message ordering Washington’s force to leave the area. Expecting a reprisal from the French, Washington’s troops fortified their depot in the Great Meadows, naming it Fort Necessity. On July 3, 1754 French soldiers under the command of Louis Coulon de Villiers, Jumonville’s brother, attached Fort Necessity. After a day of fighting in the rain Washington surrendered. The killing of Jumonville, which Washington admitted to in his surrender, ignited the Seven Years War, the first truly inter-continental war. Metal detector survey at Fort Necessity National Battlefield. Note the string transects to ensure proper coverage and the pin flags to mark finds. Photo by Chris Espenshade. It has long been believed that the heaviest French fire came from the tree line southeast of the fort where the trees reached within 60 yards of the fort. That’s where we focused our metal detecting efforts for the field portion of the class. We found evidence of the battle in the form of dropped and fired musket balls as well as other artifacts relating to the attack. These data confirm that at least some of the French were attacking from this location. 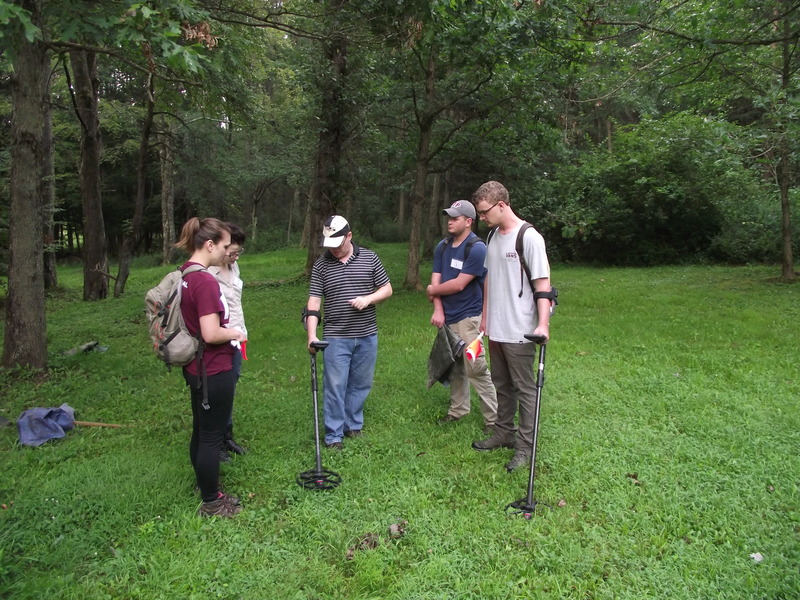 We also now have a cadre of IUP archaeologists trained to use metal detectors on an archaeological site – a skill that we can use here and that students can take with them into the professional world. It was a very productive and successful weekend. AMDA Fort Necessity National Battlefield Class Photo. Photo by Chris Espenshade. This entry was posted in Field School, Fieldwork, Grad School, Training, Undergraduate. Archaeologists needs a best metal detector that must be fully functioned, easy to handle, higher in frequency and accurate in picking things. Visit here for detailed information about metal detector. I’m trying to locate a colleague I worked with many years ago–Dr. Jim Miller. Dr Miller was the director of archaeological services for the State of Florida. Is this the same James Miller? No, sorry, it is a different James Miller. This James Miler just finished his undergrad degree at IUP. That very intersting! Thanks for the sharing. I also like to search treasores with metal detector. I think, if to find valuable treasures it must be one of the best metal detectors!